Thousands of individuals from foreign countries walk unchallenged across our southern border every day. We don't know who they are, where they come from, or their intentions. It is an invasion by definition, and our government condones it. This website presents current and undeniable documentation. 5-11-10: "President Obama, No One In Arizona Is Laughing" Our Governor's Response To Obama's inappropriate joke. The evidence on this website tells the true story. While the invasion continues daily, diminishing resources dictate that we post less frequently. CBS Theft. Mainstream media strikes again - CBS affiliate steals BIP videos. NOTICE TO NEWS ORGANIZATIONS: DON'T BE A COMMON THIEF LIKE CBS !! 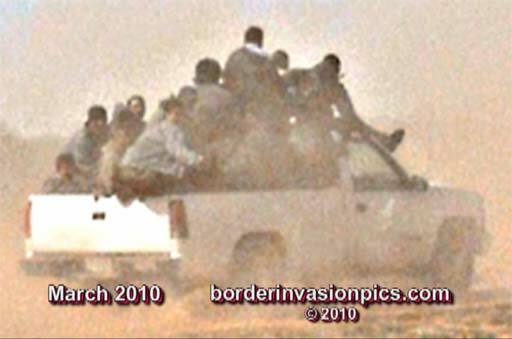 If you use Border Invasion Pics content, you must credit this website. On March 27th, Arizona rancher Rob Krentz was brutally murdered on his own property by an illegal alien. While the Krentz family and community will forever suffer their tragic loss, his murderer fled back across the wide open U.S./Mexico border to freely resume his criminal activity. Our thoughts and prayers are with the Krentz family. A massive number of people illegally enter the USA every day by simply walking unchallenged across our southern border. In the 1952 miles of border from California to Texas they use literally thousands of trails and paths, ever changing their routes to avoid detection. Cartel involvement has brought increased organizational skills to smuggling operations and, contrary to government claims, only a very small percentage are apprehended. Accurate statistics are impossible to gather, but the true numbers are staggering, and the general public remains largely uninformed. 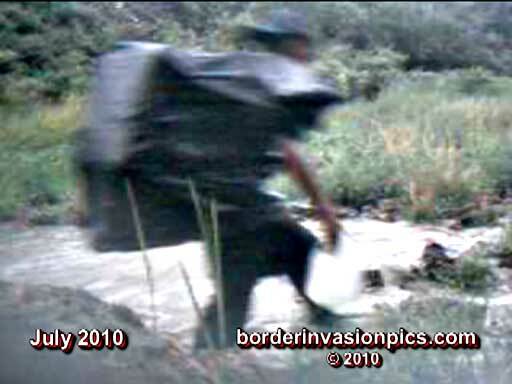 September 09 - Over 440 border intruders - even though 3 cameras on busy trails were sabotaged by the middle of the month. 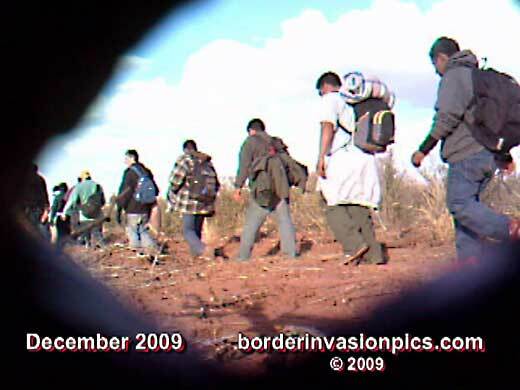 09/09/09 - Border Invasion Pics has been posting hidden camera video of border intruders walking unchallenged into the U.S. since November 2008. An ever increasing number of Washington DC visitors to the website indicates that national politicians and their appointees are viewing the action. 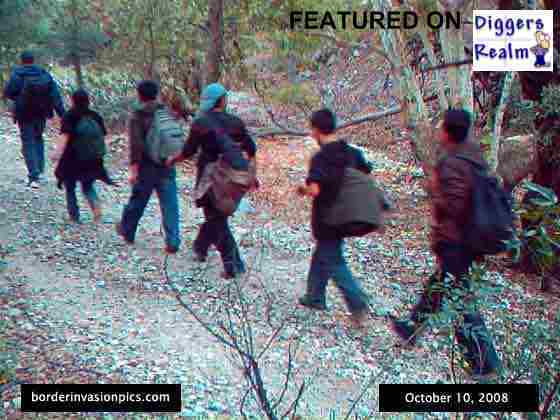 The evidence presented contradicts Janet Napolitano's statements about how difficult it has become to cross the border illegally, and it appears that DHS has seen enough Border Invasion Pics videos. Especially like the August release showing over 400 illegal aliens marching into the U.S. -- 5 miles north of the border, on just one trail, in only 35 days. 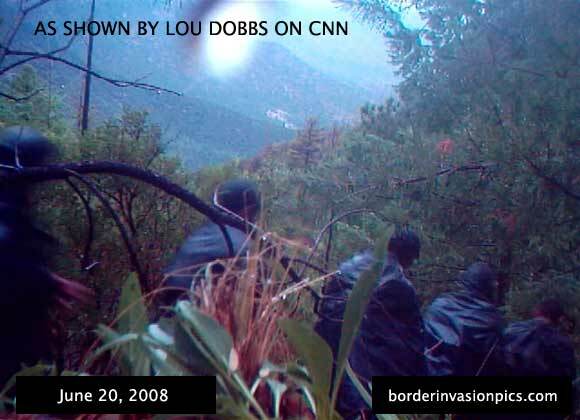 In July 2009 the U.S. Border Patrol initiated a large scale 24/7 operation to curb the flood of illegal alien traffic entering the Huachuca Mountains from the south. While the Border Patrol has previously conducted temporary operations in this area, this is a fully resourced long term effort. We should expect to see a large decline in illegal traffic through this area. Most front line Border Patrol agents are active and dedicated, but they are few in number relative to their large area of responsibility. Not only do these agents lack the necessary recources to effectively cope with the problem, they must remain aware of possible prosecution and incarceration by their own government for being too good at the job they are sworn to do. Agents Ignacio Ramos and Jose Compean remain unforgettable examples. Illegal alien group sizes range from one individual to hundreds of individuals, and groups of 40 to 50 are common. It is fair to say that the average group size conisists of a dozen or more individuals. Many groups pictured likely contain more individuals. Running from law enforcement is a criminal offense and incurs stiff criminal penalty - if you're a legal resident. This is not the case with illegal aliens and they know it. It is now common practice for them to scatter in all directions when apprehension is attempted. Since Border Patrol agents often work alone, it is unreasonable to expect an agent to capture more than one or two border intruders out of any group that "quails". 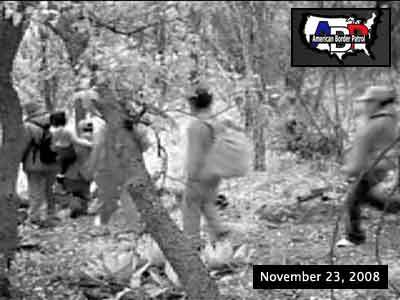 This series of thermal videos shows private citizen detection and private citizen assisted captures. These videos were shot on three consecutive nights. Private citizens brought these intruders "out of the shadows". This series of thermal videos shows private citizen detection and private citizen assisted captures. These videos were all shot in one night from one location. Repeat: one night, one location. 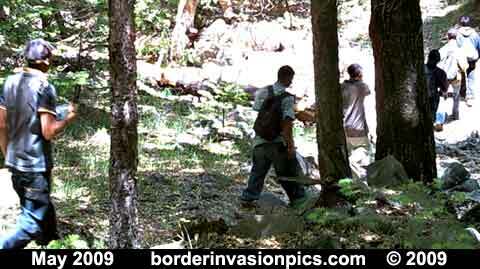 These border intruders had entered this country unchallenged until private citizens brought them "out of the shadows". Politically motivated claims of improved border security don't change the truth - an invasion is in progress across our southern border. 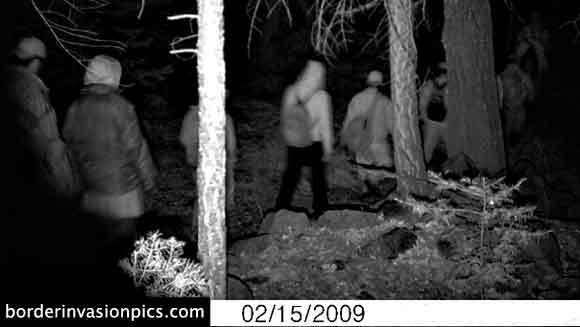 Trail cam videos from various locations. The traffic count is high. 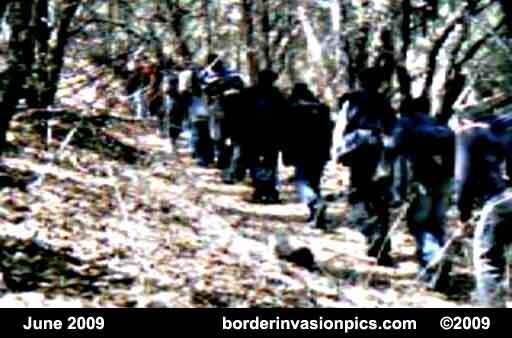 This website is dedicated to posting current pictoral evidence of the invasion of suspected border intruders across the USA/Mexico border. No form of immigration reform can be successful as long as the type of activity shown on this website can be captured on camera every day by U.S. citizens along the border. Please recommend this website to others - especially to self-serving politicians who refuse to legislate in the best interest of our nation. The argument that illegal aliens are skilled and productive workers is unsupportable - look at the evidence. Open borders are a problem, not a solution. All activity shown below is a result of citizen volunteer effort. 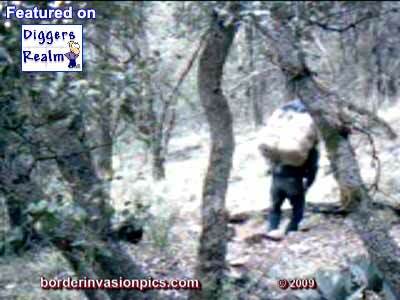 Detection is by citizen, and where apprehension takes place it is by citizen guidance of Border Patrol agents. More and more citizens are doing a job our government won't do. 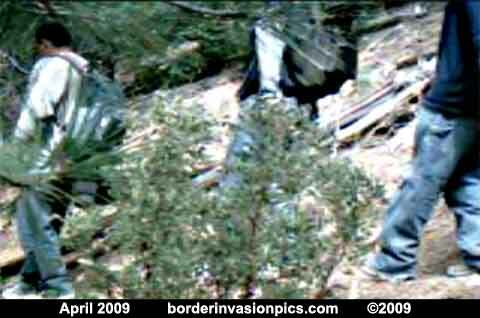 03/04/09 - Intruders breach on old section of the border fence. 02/24/09 - 30 second video from Texas Border Volunteers - 17 in "Bailout!!" We now show a single photo from each burst because of webmaster time constraints. Every group pictured contained more individuals - in most cases many more. We are now showing a single representative photo from each burst because of webmaster time constraints to reformat pictures. Every group pictured contained more individuals - in most cases many more. 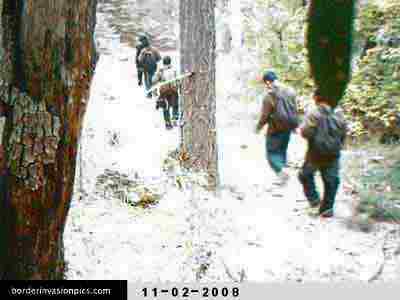 01/25/09 - Thermal Video Extravaganza - Defender spent 2 nights at the same location - 60 miles in, on the "Anmesty Trail". The second night got hectic keeping up with the activity. Very few backpacks means pickup points are close (and more trash in the desert). 01/25/09 - 3 of 5 - 120 seconds - taking a break?